Since the Apache Software Foundation came into being, it has played a developmental role in how open source communities collaborate to create great, practical software. Today Apache HTTP is the most popular web hosting platform in the world and is used across industries and sectors to host all types of applications. Below we will explore some common Apache applications and best practices that may help you overcome obstacles in your own Apache environment. What Is Apache HTTP Server? Apache HTTP Server is the world’s most used web hosting platform. Now commonly referred to as simply “Apache,” the open-source software project began in 1995 and by 2016 was estimated to power nearly half of the world’s web servers. Without Apache, the World Wide Web that gives us the www URL prefix would have been a far slower process and exponentially more expensive. Originally developed for use with Unix, Apache is now a cross-platform solution for hosting and developing web applications. Its international community of open source contributors and security specialists make it an affordable, dependable backbone for web services. Below we will take a look at some popular aspects and features of Apache and how to put them to work in your environment. 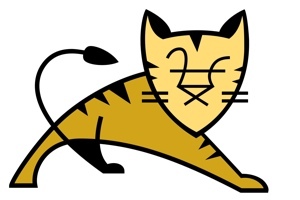 Apache Tomcat adds full JSP functionality to your web services. Apache HTTP Server has more than 20 years of proven reliability providing essential web services, but the advent of the Java interactive scripting language required more than basic HTTP functionality. Enter Apache Tomcat, a Java Server Page (JSP) and Java servlet server that can run alone or be configured to pair with existing Apache HTTP servers to add power. Apache Tomcat seamlessly processes incoming JSP and servlet requests in a designated container and passes the ensuing data to the section of the web delivery pipeline with no disruption to the end user experience. Apache Cassandra handles data storage and management for some of the biggest tech companies in the world. Scalable, fault-tolerant data storage is a cornerstone of any modern network environment. Apache addresses this need with Cassandra, the durable and decentralized storage and management system, which serves some of the world’s largest tech companies. Apache Cassandra relies on a powerful network of data centers strategically positioned around the world to provide unsurpassed fault tolerance. For instance nodes impacted by power outages or natural disaster are automatically replaced from partner sites, resulting in zero downtime. This unparalleled reliability has made Cassandra, a NoSQL database, the go-to data storage solution for major companies such as eBay, GoDaddy, and Netflix and it hosts more than 2500 nodes and serves more than a trillion requests per day. With more than two decades of proven success, it’s natural that a host of tools to augment Apache’s capabilities sprung up around the software. As with most any task, using the right tools in Apache HTTP make jobs easier and faster. Here’s an incomplete look at some of the more popular—and powerful—options for expanding Apache. Apache Cloudstack. Cloudstack is a turnkey, all-in-one solution for deploying and managing large virtual networks in the cloud. Cloudstack includes a native (and open-source) API, a sharp user interface, and supports the most popular hypervisors, including VMware and Hyper-V. GUI, command line, or web-based administrator interfaces give you pinpoint control over your cloud or hybrid Apache environment. Apache Axis 2. With a super fast runtime engine that can operate independently or as a service on Apache Tomcat, Apache Axis 2 is a web creation and management toolkit that works with most popular plugins. Apache Synapse. Easily apply and manage load balancing, switching, protocol routing, and other advanced network tasks with Apache Synapse. Install Synapse as its own unique services gateway or run it as a proxy service on Apache HTTP to stably support staggering amounts of concurrent clients with a minimal amount of overhead. Apache Thrift. Developed by FaceBook, Apache Thrift operates within the remote procedure call (RPC) framework to greatly speed the deployment of applications across platforms. Essentially Thrift wraps a complete software stack and a code generation into a package that lets your original code create working replicas of itself for other platforms, eliminating the need to tediously code versions for every common language. Want to find a specific Apache tool? Check out the complete list of in production and under development open source software projects for and in conjunction with Apache HTTP. The key to a successful Apache system is knowing how to find, manage, and react to the log data generated by Apache. The enormous number interactions occurring each second in your Apache environment create a corresponding flood of data, but any one string of it can be the key to determining where and how your network is underperforming. Mod_log_config, which lets you define the settings and storage location for your logs. Mod_log_forensic records system state immediately before and after each request, so narrowing down suspicious activity becomes much easier. Mod_logio charts all in and out traffic in bytes. Though through advanced Apache logging analytics administrators can glean a wealth of information, Apache gathers only two distinct types of logs: Access Log and Error Logs. These logs denote all critical information about who is accessing your environment, where they are going, and what they’re attempting to do while visiting. From these logs admins can gather page views and visits, successful and failed access attempts, visiting IP addresses, and more. If access logs record who went where, error logs capture what went wrong. Details from configuration problems, dropped connections, document failures like 400 errors and other mishaps are compiled in these logs. The most important power an Apache log analysis tool should unlock is visualization. Even though only two essential activities are recorded—access and error—the structure and volume of raw data contained in Apache logs can hide the needle you seek in a haystack of codes and numbers. The data you need is contained in native Apache logs, but finding it can be tricky. Here’s an example of how to count visitors. 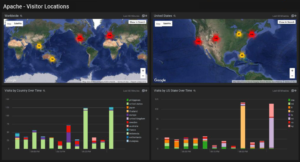 Through interactive visualization, the right log analytics tools transform that into clear, easy to understand graphs and charts that show you what’s happening in your environment. 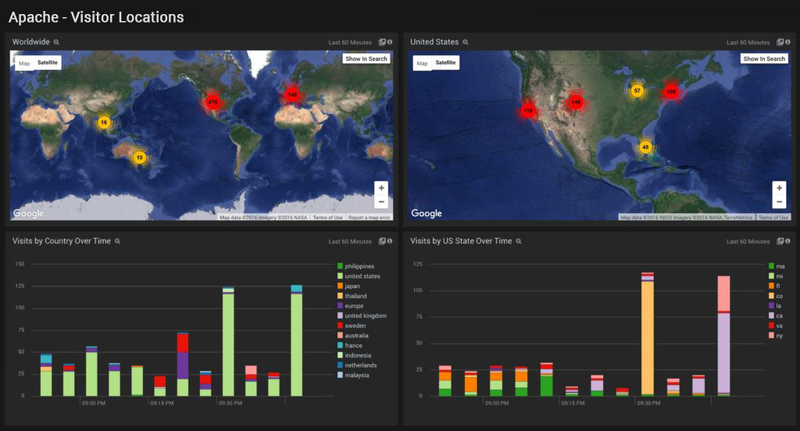 Visualization Apache log data in Sumo Logic provide actionable insights. Check out these additional links to learn more about advanced logging, react to important metrics like traffic analysis, and isolating and responding to critical errors in Apache. If you are doing business on the web, you’re doing it on or near Apache web services. One of the oldest and largest platforms in the history of the web, Apache still provides powerful, open-source solutions to modern web hosting challenges. They keys to success in Apache are understanding what it can do, expanding its power by adding additional Apache resources, and transforming raw logging data into information you can see and use. Delve deeper into the Apache’s data flow and logging to learn what you can do with Apache.